Learn how to make old fashioned peanut brittle in a few, no fail, easy steps! 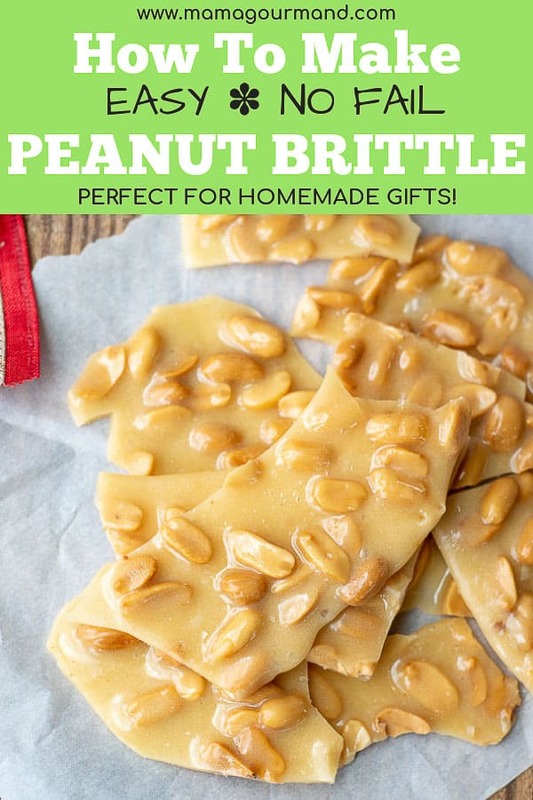 This homemade peanut brittle recipe has been made countless times and always turns out perfectly time and again. 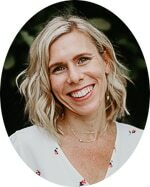 Thank you to ThermoWorks for sponsoring this post. All thoughts and opinions are truly my own. Around our house, holiday season isn’t complete without several batches of old fashioned peanut brittle. Making this homemade gift started when I was a child and now continues with my own family. Growing up, every year our teachers looked forward to receiving a tin filled with addictive, crunchy peanut brittle from us. Nonetheless, since there was six of us, they probably had to feign surprise every time. Turns out Mom was on to something. 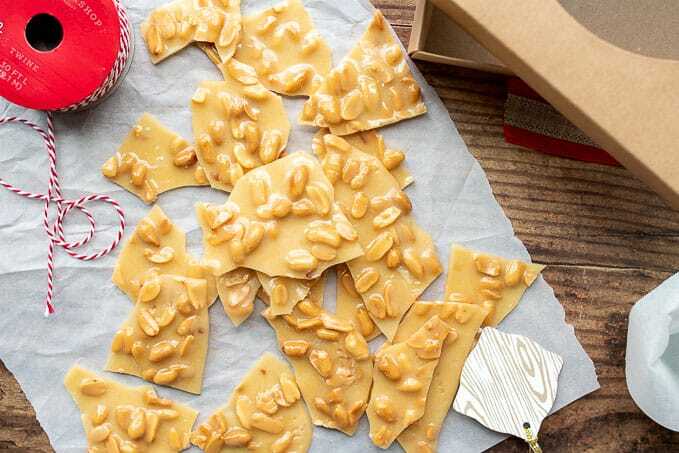 I’ve learned firsthand why peanut brittle makes the absolute perfect holiday gift. It’s economical to make. Make batches and batches of peanut brittle and it still won’t break the bank. Peanut Brittle has a long shelf life. Peanut brittle can be made weeks in advance, which is helpful during the busy holiday season. 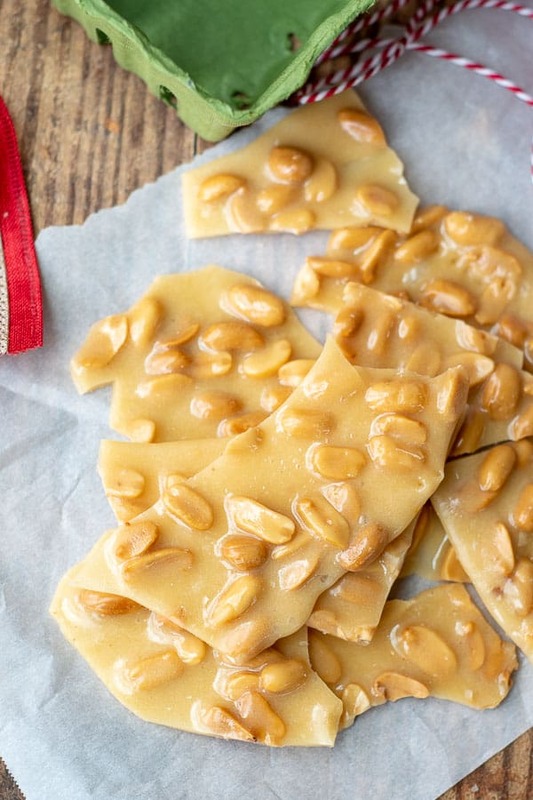 Making homemade peanut brittle is a quick, easy process. 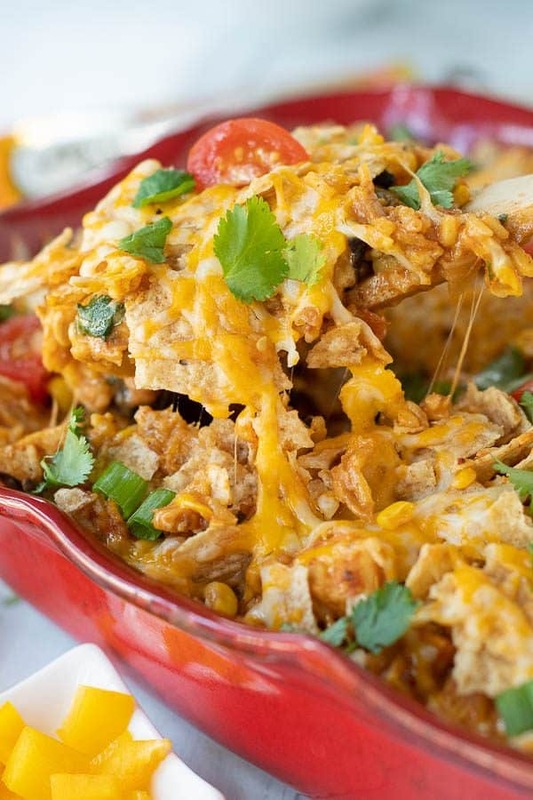 Make a batch in 15 minutes and no oven is required! It’s easy to wrap and transport. This is a present your kids can be trusted transporting to school. Check out chocolate bark recipe (another great homemade gift idea😉) to learn how to creatively wrap food gifts. Making peanut brittle requires a baking sheet, a saucepan, and a candy thermometer. ✽Candy Thermometer – This is the most paramount equipment when making any candy, such as fudge, toffee, or brittle. Temperatures must be spot on for the recipe to work. For years I used an inexpensive candy thermometer that clips onto the side of saucepan. This worked to achieve results, but it was very frustrating to work with. These types of thermometers have to be submerged in the liquid the whole time in order to slowly and gradually read the temperature. This means it won’t read the temp quickly enough to just dip it in time from time. Plus, it’s awkward to avoid hitting while stirring. So, I’d hold it in place with one hand, while stirring with the other. Also, if it’s clipped in place the reading would be for that one location only, which can result in skewed results. I upped the ante recently and purchased a Thermapen Mk4, which I’ve been eyeing since it’s always featured in Cook’s Illustrated and America’s Test Kitchen. Best. Purchase. Ever. 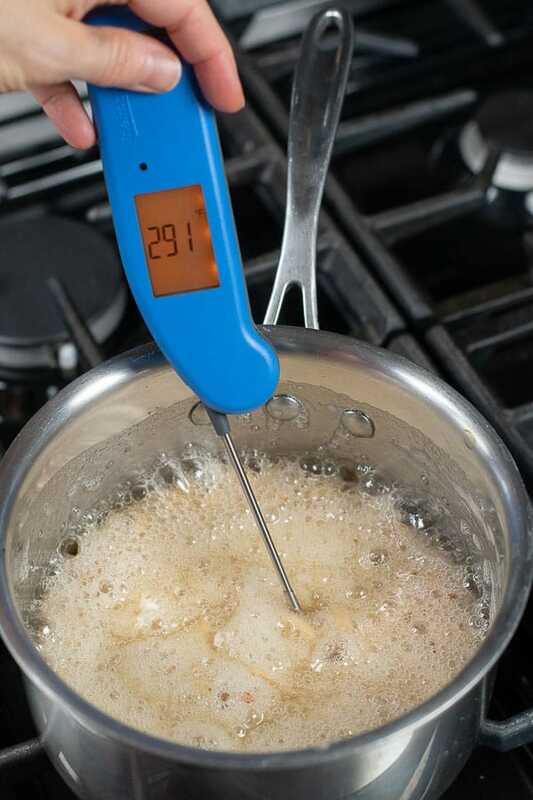 A Thermapen Mk4 gauges an absolutely spot on temperature in only two seconds! It can be dipped in and out periodically, it’s durable (no risk of mercury-filled glass bulbs breaking from temperature shock), extremely clear to read, and has so many other uses. Besides candy making, I use my Thermapen Mk4 for reading meat temperatures, water temps when proofing yeast, testing oil temperatures for frying, making yogurt, and tempering chocolate. ✽Saucepan – Ideally use a heavy-bottomed saucepan to conduct heat evenly and prevent scorching the sugar. I truly believe great cookware makes an immense difference with results. Personally I use the Calphalon Tri-Ply Stainless Steel set, because it’s affordable compared to flashier brands, performs fantastically, and will last a lifetime. 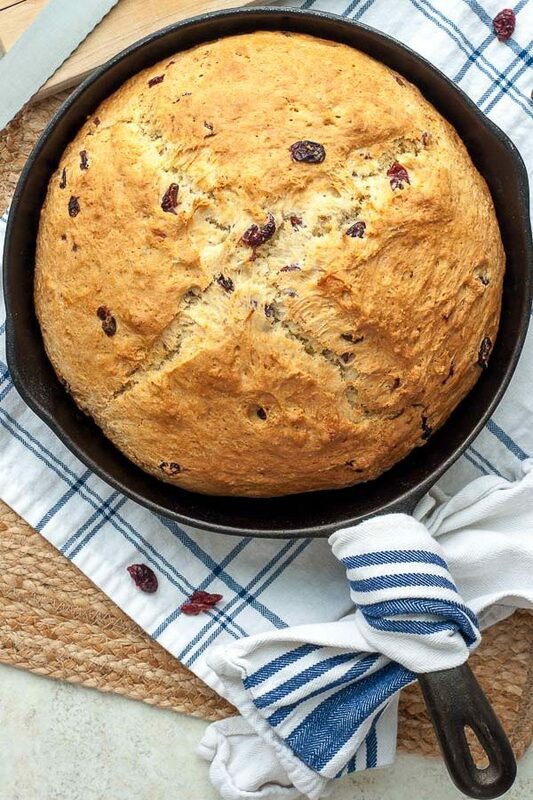 I used the Calphalon 2.5 quart saucepan for this recipe. 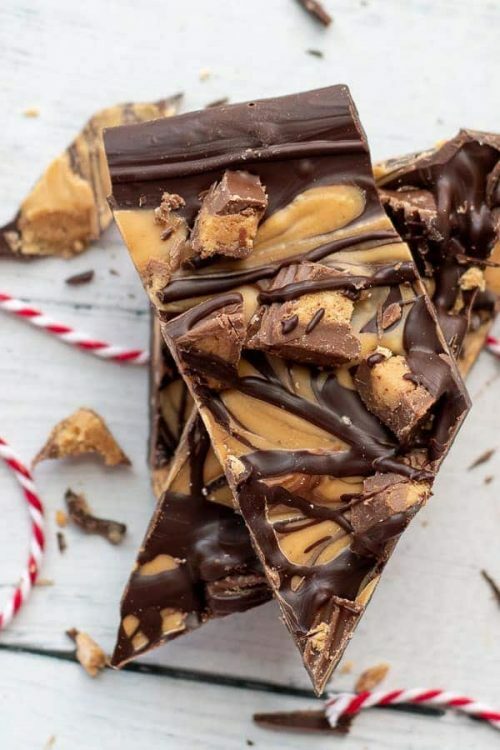 ✽Baking Sheets – Although any baking sheet will do because it’s simply used to cool the peanut brittle, Nordic Ware baking sheets are rated the best in Cook’s Illustrated, are very affordable, and great for baking. Peanut Brittle has a long shelf life and, if properly stored, can last a couple months. Simply place brittle in a completely dry, air tight container (food storage container, ziplock bag, lidded jar, or tin), away from extreme temperatures. Do not freeze or refrigerate peanut brittle because of the humidity and moisture. The peanut brittle will become sticky and lose its crunch. When making any candy make sure all the ingredients and equipment are ready to go before starting. Timing is crucial and this will avoid any mishaps. 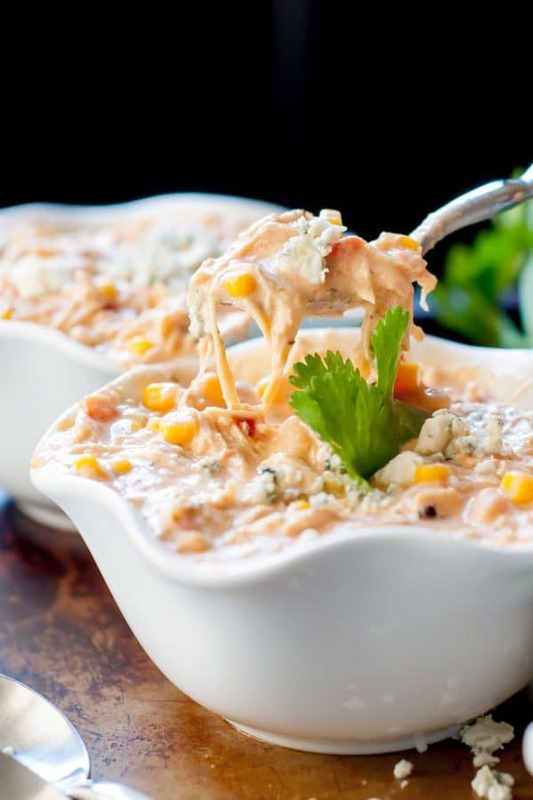 Use a bigger saucepan, at least triple the volume of the ingredients. The boiling syrup increases in volume, so there has to be ample room for expansion. Peanut brittle turns out best if the recipe is not doubled or tripled. Make one batch at a time. Luckily the process goes quick! 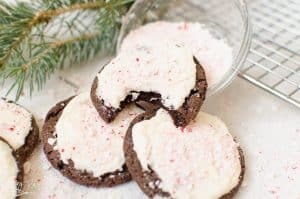 Can parchment paper or a silicone mat be used instead of greasing the pan? Yes, but DO NOT USE WAX PAPER, which will melt and stick to the peanut brittle. Why is my peanut brittle chewy, sticky, or didn’t harden? This is a temperature issue. Make sure the peanut brittle reaches exactly 300ºF / 149ºC before pouring onto baking sheet. See “Equipment Used to Make Peanut Brittle” for my recommended thermometer. Butter a baking sheet and set aside. 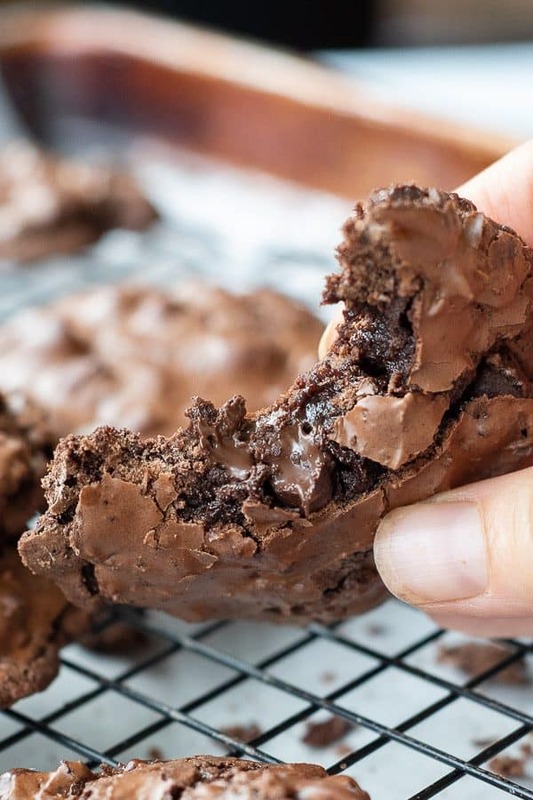 Alternatively use parchment paper or a silicone baking mat. In a large saucepan mix together sugar, corn syrup, water, and salt over medium heat. Bring to a boil and stir in peanuts. Cook until thermometer reads exactly 300ºF / 149ºC. 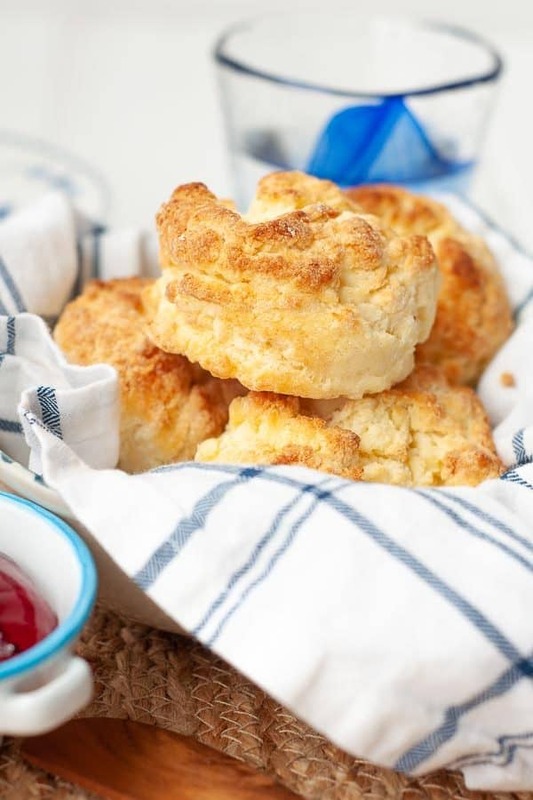 Remove from heat and stir in baking soda and softened butter. Pour onto buttered baking sheet. Spread hot peanut brittle out. As it starts to cool, pull with a fork to stretch out more. Cool completely and break into pieces. 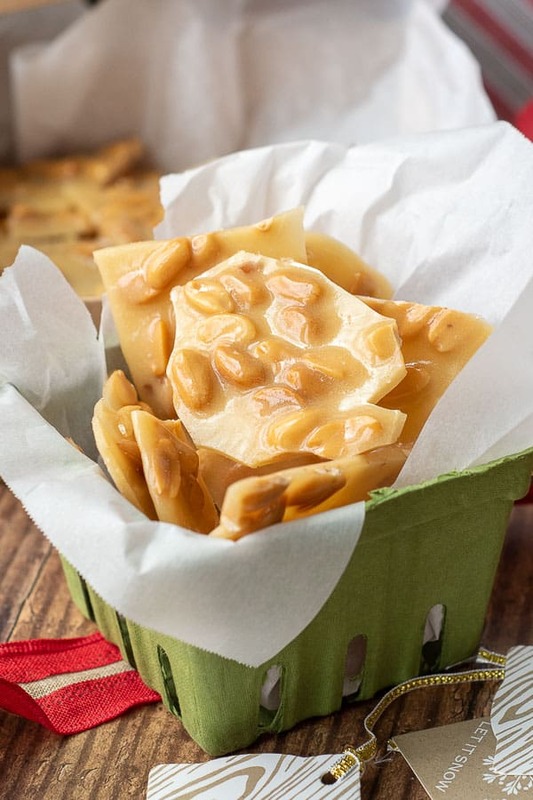 SAVE THIS PEANUT BRITTLE RECIPE TO YOUR PINTEREST BOARD! 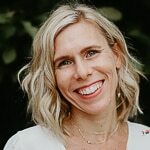 And let’s be friends on PINTEREST or INSTAGRAM! 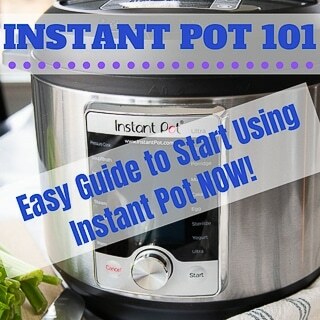 I’m always sharing great recipes! Learn how to make the best, homemade, old fashioned peanut brittle in a few easy steps! This peanut brittle recipe turns out perfectly time and again. 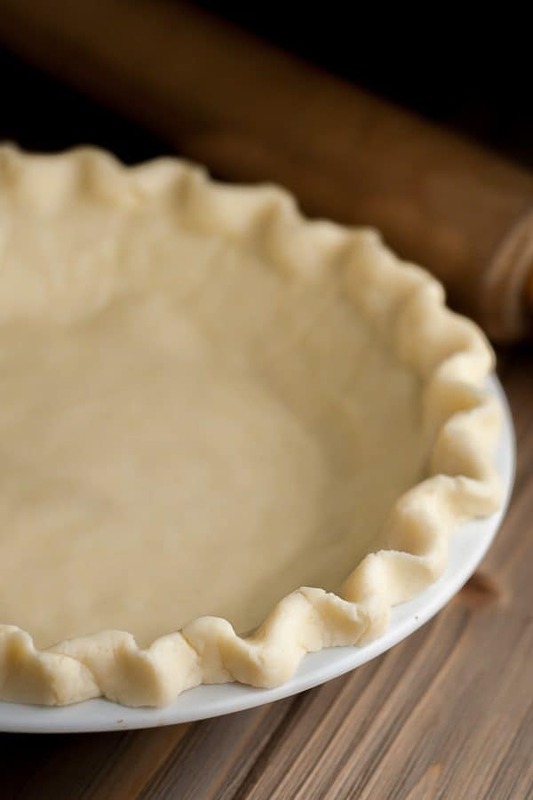 Grease a large baking sheet with some butter, or line with parchment paper, or silicone baking mat. Reserve the 2 tablespoons softened butter for recipe. In a medium saucepan combine sugar, water, salt, and corn syrup. Cook over medium heat until sugar dissolves and mixture starts to boil. Stir in peanuts. 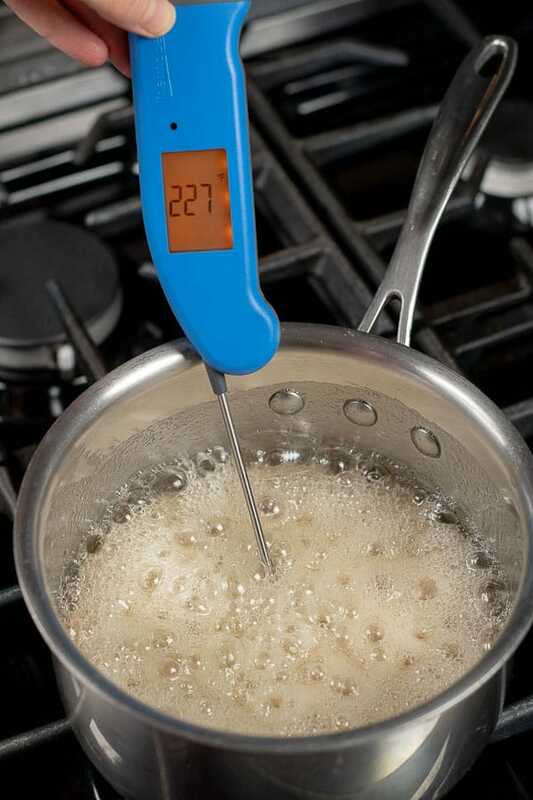 Set a candy thermometer in place and continue to cook, stirring intermittently until temperature reaches exactly 300ºF / 149ºC. This will take about 10 minutes and mixture will get very thick. Immediately remove from heat and stir in butter and baking soda vigorously. (Be careful it will boil up and expand) Pour onto the prepared baking sheet. Spread with a silicone spoon, then pull more with a fork, until it almost fills up the baking sheet. Cool and break into pieces. Store in tin or another airtight container. Why is my peanut brittle chewy, sticky, or didn't harden? This is a temperature issue. Make sure the peanut brittle reaches exactly 300ºF / 149ºC before pouring onto baking sheet. See "Equipment Used to Make Peanut Brittle" for my recommended thermometer. Yay! Enjoy while it lasts! Sure, You can pretty much substitute any kind of nut. Enjoy! Quick question. Do you use raw peanuts or salted peanuts? Salted peanuts. Not dry roasted, but the kind in the can. You can use cocktail peanuts, Spanish peanuts, or another preferred nut, like cashews. I’ll clarify in the recipe. Thanks! Just made it myself and it’s delicious. 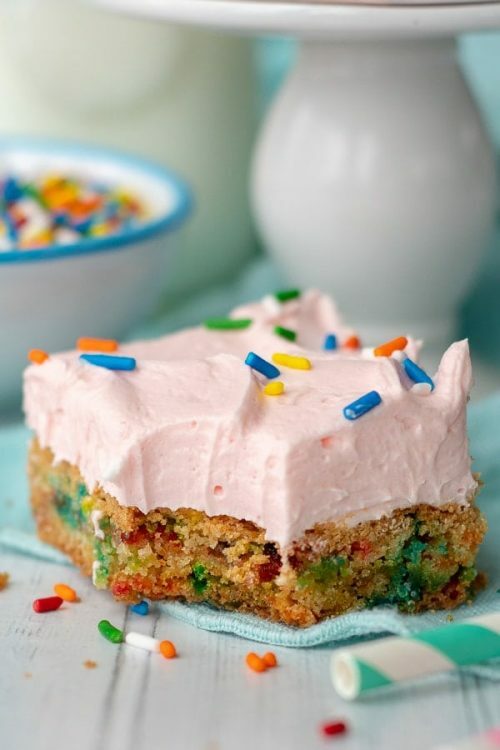 Great recipe ! Just got done making this. It was my first attempt at peanut brittle and turned out great! Thank you. The only problem is that I can’t stop eating it. I want to give it as gifts but I’m not sure it’ll last that long. That’s funny! When I make it I have to hide it from my husband or he will eat the entire thing before I can wrap it up and give it away! So glad you are enjoying it! I really appreciate you taking the time to let me know. That always makes my day! I just wrote out my holiday baking list, and I don’t think there has ever been a year I haven’t made this.